Solomon Warriors roared back into quarterfinal contention in Group B of the OFC Champions League with a 6-1 win over AS Lossi in Papeete but it was host club AS Dragon that stole the show with an incredible 4-3 injury time win over Erakor Golden Star to pull clear at the top of the group on Wednesday night. The lead changed hands three times in a pulsating evening clash and was looking like a victory for the Vanuatu club until AS Dragon captain Tamatoa Tetauira scored twice in stoppage time to steal the points. Reynald Lemaitre’s glancing header opened the scoring for the home side in the 11th minute but it took just four minutes for Erakor to claw them back through a Jacques Wanemut penalty. Elkington Molivakarua gave Erakor a perfect start to the second spell, firing a low shot past Gilbert Meriel just 38 seconds after the restart but Teinaore Seino nodded the home side level from a scrappy corner just before the hour mark. Golden Star regained the lead when Dragon defender Gabriel Vakoume headed a Ronaldo Wilkins cross into his own net via a rebound off the post and his goalkeeper with just a nervy six minutes of regular time remaining. The goal had come against the run of play with Erakor down to ten men after Jospeh Iaruel’s second yellow card earned him an early shower in the 73rd minute. The advantage finally told with Dragon pushing for an equaliser that eventually came through a Tetauira penalty after Teataura Huata was cleaned out in the box. 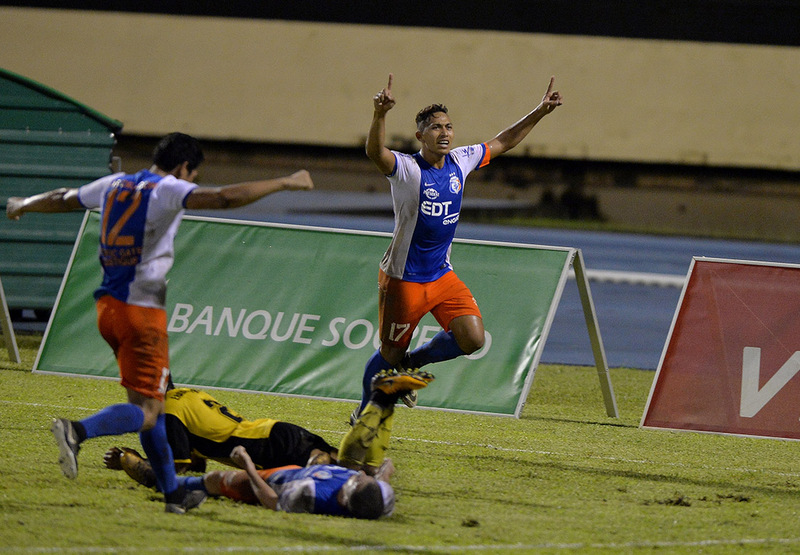 Tetauira then popped up at the back post to tap in Reynald Lemaitre’s wayward shot in the fifth minute of injury time to send the Papeete crowd in raptures and his club to the brink of a place in the quarterfinals with six points form their two matches. “It’s a win and it’s a win less attractive than what we’d expect from our first eleven,” said Tetauira after the match. A shell-shocked Erakor coach Obed Jimmy struggled to find the words after the match but promised his team will give themselves every chance a claiming a ticket to the playoffs by finishing in the top two with a win over Lossi in their remaining match. “I thought we would win tonight but the red card, that surprised me,” Jimmy said. In a must-win match for both teams in the afternoon kick-off, Solomon Warriors were comfortable throughout and made New Caledonia’s AS Lossi look lethargic by comparison. Gagame Feni lead the scoring with a hat trick that included a wonderful lob for his second towards the end of the second half, but the damage was already done during a commanding first half spell that saw Warriors net four unanswered goals including Kensi Tangis’s first of two just two minutes into the match. Feni scored his first on the 20-minute mark with goals to Tangis and John Alick rounding out the first half. Morgan Mathelon finished off a wonderful team goal for Lossi in the 73rd minute with a stunning half-volley to reduce the deficit somewhat but Feni’s added another two to inflate the score line to 6-1 and push Solomon Warriors into second place on three points, ahead of Erakor on goal difference. Solomon Warriors coach Moses Toata warned that his side must continue that vein of form if they are to beat Dragon on Saturday in their final group match and ensure a place in the last eight of the competition. “Obviously I’m very happy with the result” Toata, “my boys did very well today. “We have to keep playing like this if we want to win. We have a very important match on Saturday and hopefully we will win. With their chances of progression over, AS Lossi coach Victor Wejieme was gracious in defeat. “First, congratulations to the Solomon team, they played well today. We needed to be better organised, we were playing for qualification, but we were missing in the first half,” Wejieme said. Saturday’s final round of Group B matches see Erakor Golden Star squaring off against AS Lossi at 3pm local time with AS Dragon and Solomon Warriors meeting in the 6pm kickoff.